Linked family file JAMX1765 with spouse ancestors, click HERE. 1. James1 Doeg, born abt 1765 Of Exeter, Devon, England; died bef 1841 in England. He married on 6 Sep 1790 in St Thomas the Apostle, Exeter, Devon, England Deborah Ferris, born 1772 in Exeter, Devon, England; christened 20 May 1772 in St. Petrock, Exeter, Devon, England; died 5 Feb 1857 in Tharnington, Kent, England, daughter of John Ferris and Sarah Hore. In 1841 Deborah lived at Frerahay Street, St. Olave, Devon with her daughter Mary, her husband Thomas Linscott, their 5 children, and Sarah Doeg (12 Devon). + 2 i Sarah2 Doeg, born 27 Jan 1793 Of Exeter, Devon, England; christened 3 Apr 1796 in St. Sampson, York, Yorkshire, England; died Jul 1843/43 in Hull, Yorkshire, England. She married Abraham Dewitt. 3 ii Mary2 Doeg, born 17 Mar 1796 in York, Yorkshire, England; christened 3 Apr 1796 in St. Sampson, York, Yorkshire, England; buried 10 Mar 1797 in St. Mildred, Canterbury, Kent, England. + 4 iii David2 Doeg, born 1798 in Exeter, Devon, England; christened 21 Jan 1798 in St. Sidwell, Exeter, Devon, England. He married Rosetta Brady. 5 iv John2 Doeg, born 1800 in Romford, Essex, England; christened 1800 in Romford, Essex, England. + 6 v William2 Doeg, born 10 Nov 1801 in Norwich, Norfolk, England; christened 6 Dec 1801 in St, James Pockthorpe, Norwich, Norfolk, England; died 5 Mar 1850 in Magdalen Street, Exeter, Devon, England. He married Sarah Langston. 7 vi James2 Doeg, born 1805 in Canterbury, Kent, England; christened 14 Jul 1805 in St. Paul's. Canterbury, Kent, England; buried 21 Feb 1813 in St. Dunstans Church, Canterbury, Kent, England. + 8 vii Mary2 Doeg, born 1807 in Canterbury, Kent, England; christened 7 Jun 1807 in Holy Cross Westgate, Canterbury, Kent, England; buried 12 May 1833 in Exeter, Devon, England. She married Thomas Linscott. 9 viii Elizabeth2 Doeg, born 24 Jun 1809 in Canterbury, Kent, England; christened 16 Jul 1809 in St. Dunstans Church, Canterbury, Kent, England. She married (1) Mr. Allen; (2) on 20 Jul 1857 in Old Church, St. Pancras, Middlesex, London, England William Hough Smith, born abt 1809 in England, son of William Smith and Mary Hough. Notes: Elizabeth's marriage to William Smith lists her father as James Doig, dead. MARRIAGE: Witnesses were John West and ?. 10 ix Ann2 Doeg, born 13 Feb 1812 in Canterbury, Kent, England; christened 11 Mar 1812 in St. Dunstans Church, Canterbury, Kent, England; died Apr 1876/76 in Pancras, London, England. She married on 14 Jul 1855 in Marylebone, Middlesex, London, England Henry Bielfeld, born 1807/09 in Haurtree, Devon, England; died Oct 1892/92 in Pancras, London, England. 2. Sarah2 Doeg (James1), born 27 Jan 1793 Of Exeter, Devon, England; christened 3 Apr 1796 in St. Sampson, York, Yorkshire, England; died Jul 1843/43 in Hull, Yorkshire, England. She married on 25 Aug 1811 in Kingston, Yorkshire, England Abraham Dewitt, born 1779/80 Of Hull, Yorkshire, England; died Jan 1839/39 in Hull, Yorkshire, England. Marriage uncertain. Sarah was listed as age 26 at the time of the marriage in 1811, or born 1784/5. 11 i Elizabeth3 Dewitt, born 1812 in Kingston Upon Hull, Yorkshire, England; christened 4 Oct 1812 in St. Mary, Kingston Upon Hull, Yorkshire, England. 12 ii William3 Dewitt, born 1824 in Kingston Upon Hull, Yorkshire, England; christened 17 Sep 1824 in St. Mary, Kingston Upon Hull, Yorkshire, England. 13 iii John Henry3 Dewitt, born 1837 in Kingston Upon Hull, Yorkshire, England; christened 26 Feb 1837 in St. Mary, Kingston Upon Hull, Yorkshire, England. 4. David2 Doeg (James1), born 1798 in Exeter, Devon, England; christened 21 Jan 1798 in St. Sidwell, Exeter, Devon, England. He married on 7 Feb 1820 in St. Mary Northgate, Canterbury, Kent, England Rosetta Brady, born abt 1799 Of Canterbury, Kent, England; died Jan 1840/40 in Exeter, Devon, England. + 14 i James3 Doeg, born 1821 in Canterbury, Kent, England; christened 29 Jul 1821 in St. Mary Northgate, Canterbury, Kent, England; died 7 Nov 1887 in 31 Thompson Street, Hendon, Sunderland, Durham, England; buried 10 Nov 1887 in Sunderland, Durham, England. He married Mary Sara Fulham. 15 ii Sarah3 Doeg, born 1823 in Canterbury, Kent, England; christened 17 Aug 1823 in St. Mildred, Canterbury, Kent, England; died 1823/32 in England. 16 iii Eliza3 Doeg, born 1825 in Exeter, Devon, England; christened 15 May 1825 in St. Sidwell, Exeter, Devon, England; died 1825/27 in Exeter, Devon, England. 17 iv Elizabeth3 Doeg, born 1827 in Exeter, Devon, England; christened 10 Feb 1827 in St. Mary Major, Exeter, Devon, England. She married on 28 Jan 1857 in St. Leonards, Shoreditch, Middlesex, London, England John Barker, born 1833/34 Of Shoreditch, Middlesex, London, England, son of John Barker. Notes: An Elizabeth Doeg died 25 Mar 1828 in Exeter, but it does not appear to be this Elizabeth. At her marriage she was listed as age 30, daughter of David Doeg, shoe maker. MARRIAGE: Witnesses were Henry Randall and Sarah Randall (sister). + 18 v Sarah3 Doeg, born 1829 in Exeter, Devon, England; christened 5 Nov 1832 in St. David, Exeter, Devon, England; died aft 1891 Of London, England. She married (1) Francis Hamilton; (2) Henry Randall; (3) Jacob Joseph Clark. 6. William2 Doeg (James1), born 10 Nov 1801 in Norwich, Norfolk, England; christened 6 Dec 1801 in St, James Pockthorpe, Norwich, Norfolk, England; died 5 Mar 1850 in Magdalen Street, Exeter, Devon, England. He married on 6 May 1821 in Exeter, Devon, England Sarah Langston, born 3 Oct 1798 in Exeter, Devon, England; christened 9 Dec 1798 in Exeter, Devon, England; died Apr 1855/55 in Exeter, Devon, England, daughter of Samuel Langston and Mary Worth. In 1838 William was a fuller and beadle of the Guild of Weavers, Tuckers and Shearmen in Exeter, Devon. DEATHS - March 5, after a long illness, Mr. Doeg, Magdalen st., aged 51. In 1851 Sarah was a widow and needle woman residing on Magdalen Street, Holy Trinity, Exeter, Devonshire with her daughters Emma, Ellen, and Louisa Mary. 19 i Emma Langston3 Doeg, born 11 Feb 1824 in Cripplegate, London, England; died Jul 1856/56 in Exeter, Devon, England. She married in Jan 1852/52 in Exeter, Devon, England Nicholas Harris Spindley Jones, born 1812/13 in Plymouth, Devon, England; died Apr 1883/83 in Exeter, Devon, England. Notes: Emma was a milliner. + 20 ii William Samuel3 Doeg, born 7 Sep 1826 in Exeter, Devon, England; christened 3 Oct 1826 in Exeter, Devon, England. He married (1) Ellen Hutchins; (2) Mary Ann Jacobs; (3) Amy Mare. 21 iii Maria Elizabeth3 Doeg, born 1829 in Exeter, Devon, England; christened 15 Mar 1829 in Exeter, Devon, England. + 22 iv Ellen (Helen)3 Doeg, born 1832 in Exeter, Devon, England; christened 29 Jul 1832 in Exeter, Devon, England. She married William Hex Venn. 23 v Louisa3 Doeg, born 1835 in Exeter, Devon, England; christened 23 Jan 1835 in Exeter, Devon, England; died Infant in Exeter, Devon, England. 24 vi Louisa Mary3 Doeg, born Oct 1842/42 in Exeter, Devon, England. Notes: A Louisa Doeg, age 18, English, departed Plymouth, England on the ship "Herald" and arrived in Melbourne, Australia on 1 June 1859. 8. Mary2 Doeg (James1), born 1807 in Canterbury, Kent, England; christened 7 Jun 1807 in Holy Cross Westgate, Canterbury, Kent, England; buried 12 May 1833 in Exeter, Devon, England. She married on 12 Oct 1828 in Ide near Exeter, Devon, England Thomas Linscott, born 1809 in Lympstone, Devon, England; christened 2 Oct 1809 in Lympstone, Devon, England; died Apr 1879/79 in St. Thomas, Devon, England, son of Thomas Linscott and Sarah Elliott. Burials recorded 21 Apr 1831 and 12 May 1833 for Mary Ann Linscott in Exeter, one possibly being a daughter. In 1841 Thomas Linscott (35 Devon) was a glazier at Friernhay Street, St. Olave, Exeter, Devon with his wife Mary (30 Devon), children John (12), Thomas (7), Lyra (5), William (3), and Mary (1), and Deborah Doeg (70 Devon) and Sarah Doeg (12 Devon). In 1851 Thomas was a master miller residing at Lympstone Mill, Lympstone, Devon with his wife Mary and children Thomas B., William, James, John Henry, Mary, Sarah, Alfred, Edwin, and Ellen. In 1861 he was a miller and maltster at Lympstone Mill with his wife Mary and children William (miller), Mary (dress maker), Alford, Edwin, and Ellen. In 1871 he was a retired maltster at Lympstone with wife Mary and son William. + 25 i John Doeg3 Linscott, born 1829 in Exeter, Devon, England; christened 11 Mar 1829 in Exeter, Devon, England. He married Rosetta Ellen Godfrey. 14. James3 Doeg (David2, James1), born 1821 in Canterbury, Kent, England; christened 29 Jul 1821 in St. Mary Northgate, Canterbury, Kent, England; died 7 Nov 1887 in 31 Thompson Street, Hendon, Sunderland, Durham, England; buried 10 Nov 1887 in Sunderland, Durham, England. He married on 5 May 1842 in Trinity Memorial Anglican Chapel, Montreal, Quebec, Canada Mary Sara Fulham, born 1818/19 in Clonwheelan, Edgeworth, Longford, Ireland; died 16 Mar 1892 in 2 East Hendon Road, Sunderland, Durham, England; buried 20 Mar 1892 in Bishopwearmouth Cemetery, Sunderland, Durham, England, daughter of Elizabeth Doran. In 1851 James was a Private in the Army at Fulwood Barracks, Preston, England with his wife Ann(?) and children Sarah, Eliza, and William. In 1861 James was a provision dealer residing at 13 Hill Street, East Sunderland, Durham with his wife Mary and 7 children. In 1871 he was an inn keeper at the Orlando Hotel Public House, 29 Church Street, Sunderland with wife Mary and children William (bar man), David (butcher), Rosetta, Mary, and Ann. In 1881 James was a provision dealer residing at 31 Thompson Street, Bishopwearmouth, Durham (page 6) with his wife Mary. James was a Chelsea Pensioner. He served as a Corpral in the 85th Regiment of Foot. In 1891 Mary live alone at 14 East Street, Bishop Wearmouth, Durham. + 26 i Mary Sarah4 Doeg, born 5 Jun 1842 in Quebec, Canada; died Oct 1888/88 in Easington, Durham, England. She married William Wales. + 27 ii Eliza4 Doeg, born 1848/49 in Ireland; died 24 Aug 1893 in Sunderland, Durham, England. She married James Conrad Baker. 28 iii William James4 Doeg, born 1849/50 in Ireland; died 10 Nov 1877 in Infirmary, Bishopwearmouth, Durham, England. Notes: Sunderland Daily Echo and Shipping Gazette - Monday 17 January 1876: William Doeg was sent to the House of Corrections for two months, with hard labour, for haveing assaulted Jamed Doeg and Mary Doeg. The prisoner came up for the nineteenth time. + 29 iv David John4 Doeg, born 1851/52 in Hull, York, England; died Apr 1924/24 in Sunderland, Durham, England. He married Mary Jane Coulthard. + 30 v Rosetta4 Doeg, born 1853/54 in Bristol, Gloucester, England; died Jul 1895/95 in Islington, London, England. She married George Hunter Jobson. + 31 vi Mary Jane4 Doeg, born Apr 1855/55 in Sunderland, Durham, England; died Oct 1924/24 in Sunderland, Durham, England. She married Leonard Waters Moore. + 32 vii Hannah (Ann) Marie4 Doeg, born 19 Sep 1858 in Sunderland, Durham, England; died Nov 1915 in Seaham Harbour, Durham, England; buried 20 Nov 1915 in Seaham Harbour, Durham, England. She married Matthew Miller. 18. Sarah3 Doeg (David2, James1), born 1829 in Exeter, Devon, England; christened 5 Nov 1832 in St. David, Exeter, Devon, England; died aft 1891 Of London, England. She married (1) in Jul 1846/46 in Exeter, Devon, England Francis Hamilton, born 1818/19 in Truro, Cornwall, Wales; died Apr 1853/53 in Merthyr, Glamorgan, Wales; (2) on 26 Mar 1854 in Parish Church, Neath, Glamorgan, Wales Henry Randall, born 1820/21 in Haselbury, Somerset, England; died 1861/68 in England, son of Jonathan Randall; (3) in Oct 1868/68 in Brentford, Middlesex, England Jacob Joseph Clark, born 1814/15 in Norwich, Norfolk, England; died aft 1891 Of London, England. In 1841 Sarah lived with her uncle Thomas Linscott and grandmother in Exeter. In 1851 Francis was a blacksmith Caetwmpyn, Upper Merthyr Tydfil, Glamorgan, Wales with his wife Sarah (22 Exeter). In 1861 Henry was a laborer residing at 22 Bywater Street, Chelsea, London with his wife Sarah and 3 sons; he lived at the same address as his brother James. In 1871 Jacob Clark was a printer residing on Borton Road, Ealing, Middlesex with his wife Sarah, their children Annie, Walter, and Jane, his previous children Elizabeth and Christopher, and her previous children Edward and Kate Rendall. In 1881 Joseph Clark was a printer & compositor at Fenham Road, Peckham, Camberwell, London with his wife Sarah and daughters Anne and Kate Rendall. In 1891 Jacob A. Clark was a printer compositor at 14 Ash Street, St. Mary Newington, London with his wife Sarah (62 Exeter). 33 i Henry James4 Randall, born 1855 in Neath, Glamorgan, Wales; christened 17 Dec 1855 in Neath, Glamorgan, Wales. Notes: He may be the Henry James Rundle who died Apr/Jun 1863 in Chelsea. 34 ii Francis William4 Randall, born 1 Dec 1857 in Clerkwell, London, England; christened 27 Dec 1857 in St. Thomas Chartrhouse, Finsbury, London, England. Notes: In 1871 Francis was a boarder at the Shoe Black Home, Bessborough Place, St. John Westminster, London. 35 iii Edward George4 Randall, born 30 Sep 1859 in 4 Ship Court, Old Bailey, London, England. Notes: He may be the Edward George Rendell who died at age 25 in Jan/Mar 1885 at Manchester. + 36 iv Kate Aquila4 Randall, born Apr 1862/62 in St. George Hanover Square, Middlesex, London, England. She married James A. Sampson. 37 i Annie Doeg4 Clark, born Jul 1869/69 in Brentford, Middlesex, England. 38 ii Walter Appleton4 Clark, born Oct 1870/70 in Brentford, Middlesex, England. 39 iii Jane Appleton4 Clark, born Oct 1870/70 in Brentford, Middlesex, England. 20. William Samuel3 Doeg (William2, James1), born 7 Sep 1826 in Exeter, Devon, England; christened 3 Oct 1826 in Exeter, Devon, England. He married (1) in Jul 1848/48 in Exeter, Devon, England Ellen Hutchins, born 1823/24 Of Exeter, Devon, England; died 20 Mar 1850 in Exeter, Devon, England, daughter of John Hutchins and Ellen Grant; (2) in Apr 1853/53 in Wells, Somerset, England Mary Ann Jacobs, born 1826/27 in England; died 2 May 1854 in Wells, Somerset, England; (3) on 5 Nov 1854 in Baptist Chapel, Wells, Somerset, England Amy Mare, born 1817/18 in Morchard Bishop, Devon, England; died Jan 1894/94 in Exeter, Devon, England. In 1851 William was a widower an print compositer, a visitor at 77 West Street, St. James, Poole, Dorset with James Tribble Jr. and family. In 1861 he was overseer of a paper printer residing at Bartonhams Allotment, St. Owen, Hertfordshire with his wife Amy and son Charles (scholar). + 40 i Charles Gordon Grant4 Doeg, born Oct 1848/48 in Exeter, Devon, England; died Oct 1895/95 in West Derby, Lancashire, England. He married Margaret Temple. 22. Ellen (Helen)3 Doeg (William2, James1), born 1832 in Exeter, Devon, England; christened 29 Jul 1832 in Exeter, Devon, England. She married in Jul 1854/54 in Exeter, Devon, England William Hex Venn, born 1830 in Exeter (St. Thomas), Devon, England; christened 3 Aug 1830 in St. Thomas the Apostle, Exeter, Devon, England; died Jan 1894/94 in Exeter, Devon, England, son of James Venn and Jane (---). In 1891 Ellen was a milliner on Priory Road, Wrentham, Devon with daughters Ellen Venn and Mary Folkard and her 6 children. In 1871 William was a carpenter residing at 3 Friars Place, St. Sidwell, Holy Trinity, Devon with his wife Ellen and children Ellen, James, and Amy; his father lived next door. In 1881 William was a joiner residing at 5 Friars Place, Holy Trinity with his wife Ellen, children Ellen, James, and Amy, and his father (timber merchant). + 41 i Mary Catherine4 Venn, born Jul 1857/57 in Exeter, Devon, England. She married Frederick (Fred) Folkard. 42 ii Ellen Lenevaa4 Venn, born Jul 1859/59 in Exeter, Devon, England. + 43 iii James Doeg4 Venn, born Apr 1861/61 in Exeter, Devon, England; died 19 Dec 1948 in Exeter, Devon, England. He married Annie Lewis. + 44 iv Amy Margaret4 Venn, born Oct 1866/66 in Exeter, Devon, England. She married William Henry Parker. 25. John Doeg3 Linscott (Mary2 Doeg, James1), born 1829 in Exeter, Devon, England; christened 11 Mar 1829 in Exeter, Devon, England. He married on 28 Nov 1848 in St. Pancras Parish Church, Camden, London, England Rosetta Ellen Godfrey, born 1830/31 in London, England; died Oct 1896/96 in St. Saviour Southwark, London, England, daughter of Edward Godfrey. In 1851 John was a glazier and painter at 16 Colville Place, Tottenham Court, St. Pancras, Middlesex with wife Rosetta and siblings William, Jane, and Elizabeth. In 1861 he was a painter on Silver Street, St. George, Bloomsbury, Camden. In 1871 he was decoration painter at Coker College, Lambeth, London with Rosetta and children Godfrey and Sarah R. (?). 45 i James Doeg4 Linscott, born Jul 1848/48 in St. Pancras, Somers Town, London, England; buried 13 Jan 1851 in St. Pancras, Middlesex, England. 46 ii Frederick Elliott4 Linscott, born 25 Aug 1849 in St. Pancras, Somers Town, London, England; died Aug 1849/49 in St. Pancras, Somers Town, London, England. 47 iii Frederick Elliott4 Linscott, born Oct 1850/50 in St. Pancras, Somers Town, London, England; died Infant in St. Pancras, Middlesex, England. 48 iv Charlotte Webb4 Linscott, born 10 Jun 1851 in St. Pancras, Somers Town, London, England; christened 1 Jul 1860 in St. George, Bloomsbury, Camden, England; died Oct 1929/29 in Southwark, London, England. She married (1) on 4 Sep 1875 in Saint John The Evangelist, Walworth, London, England William Richard Harry Purchase, son of William Purchase; (2) on 7 Feb 1897 in Saint John The Evangelist, Walworth, London, England William Sharpe, born 1861/62, son of William Sharpe. 49 v Blanche (Hattie) Olive4 Linscott, born Jan 1853/53 in St. Pancras, Somers Town, London, England. 50 vi Godfrey Brown4 Linscott, born Jul 1855/55 in St. Pancras, Somers Town, London, England. 51 vii Thomas Edward4 Linscott, born Jul 1857/57 in St. Pancras, Somers Town, London, England. 52 viii Mary Rose4 Linscott, born Apr 1859/59 in St. Pancras, Somers Town, London, England. 53 ix Frances4 Linscott, born Apr 1860/60 in St. Pancras, Somers Town, London, England. 54 x Emily S.4 Linscott, born Oct 1866/66 in St. Pancras, Somers Town, London, England. 26. Mary Sarah4 Doeg (James3, David2, James1), born 5 Jun 1842 in Quebec, Canada; died Oct 1888/88 in Easington, Durham, England. She married in Jul 1866/66 in Sunderland, Durham, England William Wales, born Jul 1845/45 in Sunderland, Durham, England, son of Thomas Wales and Ann (---). In 1871 William was a grocer at 13-1/2 Mill Street, Sunderland, Durham with wife Sarah, sons James D and William, and sister-in-law Ann M. In 1881 he was a blacksmith at 35 Robinson Terrace, South Bishop Wearmouth, Durham with Mary and 7 children. In 1891 he was a widower and glass bottle maker at 3 Candlish Terrace, Dawdow, Durham with 5 children. 55 i James Doeg5 Wales, born Jul 1868/68 in Sunderland, Durham, England. He married in Jul 1892/92 in Sunderland, Durham, England Mary Ann (---). 56 ii William5 Wales, born Jul 1870/70 in Sunderland, Durham, England. 57 iii Maria Annetta5 Wales, born Apr 1872/72 in Sunderland, Durham, England. 58 iv David G.5 Wales, born 1873/74 in Sunderland, Durham, England. 59 v Florence Annie5 Wales, born Apr 1875/75 in Sunderland, Durham, England. 60 vi Mary Sarah5 Wales, born Jul 1878/78 in Sunderland, Durham, England. 61 vii Thomas Fulham5 Wales, born Jan 1881/81 in Sunderland, Durham, England. 27. Eliza4 Doeg (James3, David2, James1), born 1848/49 in Ireland; died 24 Aug 1893 in Sunderland, Durham, England. She married in Jul 1865/65 in Sunderland, Durham, England James Conrad Baker, born 1844/45 in Sunderland, Durham, England, son of John Baker and Catherine (---). In 1871 Conrad was a grocer at 41 Robinson Lane, East Sunderland, Durham with wife Eliza, daughters Mary, Margaret, and Rosette, and a servant. In 1871 James was foreman for a coal dealer (Hendon Landale) at Octogan Cottage, East Sunderland with Eliza and 7 children. In 1891 James was coal foreman at Moor Terrace, Sunderland with Eliza and 6 children. 62 i Mary S.5 Baker, born Jan 1866/66 in Sunderland, Durham, England. 63 ii Margaret Elizabeth5 Baker, born Jul 1867/67 in Sunderland, Durham, England. 64 iii James Doeg5 Baker, born Jul 1868/68 in Sunderland, Durham, England; died Apr 1870/70 in Sunderland, Durham, England. 65 iv Rosetta Bridget5 Baker, born Apr 1870/70 in Sunderland, Durham, England. 66 v Conrad5 Baker, born 1872/73 in Sunderland, Durham, England. 67 vi Catherena5 Baker, born 1875/76 in Sunderland, Durham, England. 68 vii John5 Baker, born 1877/78 in Sunderland, Durham, England. 69 viii Eliza5 Baker, born 1879/80 in Sunderland, Durham, England. 29. David John4 Doeg (James3, David2, James1), born 1851/52 in Hull, York, England; died Apr 1924/24 in Sunderland, Durham, England. He married in Jul 1879/79 in Sunderland, Durham, England Mary Jane Coulthard, born Apr 1857/57 in Sunderland, Durham, England; died 9 Mar 1932 in Sunderland, Durham, England; buried 14 Mar 1932 in Cemetery, Sunderland, Durham, England, daughter of Thomas Coulthard and Margaret Fairbairn. In 1891 David was a butcher residing at 3 Tyne Steet, Bishop Wearmouth, Durham with his wife Mary and sons David, Thomas, and William. In 1901 he was a shipyard laborer residing in Sunderland, Durham, Yorkshire with his wife Mary and 6 children. In 1911 David John Doeg lived in Sunderland with wife Mary Jane, and children William James, Thomas, Margaret, and Joseph Charles. 70 i William James C.5 Doeg, born 5 Nov 1881 in Sunderland, Durham, England; died Jan 1882/82 in Sunderland, Durham, England. + 71 ii David John5 Doeg, born 19 Apr 1883 in Sunderland, Durham, England; died Jan 1953/53 in Sunderland, Durham, England. He married Mary Ann Miller. + 72 iii Thomas Coulthard5 Doeg, born 14 Jan 1886 in Sunderland, Durham, England; died 16 May 1936 in Sunderland, Durham, England; buried 21 May 1936 in Bishopwearmouth. He married Edith Mary (Maria) Anna Grummett. 73 iv William James5 Doeg, born 19 Sep 1887 in Sunderland, Durham, England. + 74 v Margaret5 Doeg, born 20 Apr 1892 in Sunderland, Durham, England. She married Ferguson Gowland Tinmouth. 75 vi Joseph Charles C.5 Doeg, born 13 Aug 1896 in Sunderland, Durham, England; died Apr 1929/29 in Sunderland, Durham, England. 76 vii Mary Jane Coulthard5 Doeg, born 13 Sep 1899 in Sunderland, Durham, England; died 26 May 1903 in Sunderland, Durham, England. 30. Rosetta4 Doeg (James3, David2, James1), born 1853/54 in Bristol, Gloucester, England; died Jul 1895/95 in Islington, London, England. She married in Apr 1875/75 in Newcastle, Northumberland, England George Hunter Jobson, born 1838/43 in Newcastle, Northumberland, England. In 1881 George was a general laborer at 22 Parade, Bishopwearmouth, Durham with Rosetta and 4 children. In 1891 he was a traveller at 16 Henry Place, Islington, London with wife Rosetta and 4 children. 77 i Mary Hunter5 Jobson, born Oct 1875/75 in Sunderland, Durham, England. 78 ii George Frederick5 Jobson, born Apr 1877/77 in Sunderland, Durham, England. 79 iii Rosetta Isabella5 Jobson, born Apr 1879/79 in Middlesbro, York, England. 80 iv William James D.5 Jobson, born Apr 1881/81 in Sunderland, Durham, England; died Jul 1881/81 in Sunderland, Durham, England. 81 v Daniel5 Jobson, born 1882/83 in Islington, London, England. 82 vi James Doeg5 Jobson, born Jul 1884/84 in Islington, London, England. 31. Mary Jane4 Doeg (James3, David2, James1), born Apr 1855/55 in Sunderland, Durham, England; died Oct 1924/24 in Sunderland, Durham, England. She married in Jul 1875/75 in Sunderland, Durham, England Leonard Waters Moore, born Jan 1848/48 in Sunderland, Durham, England; died Jan 1915/15 in Sunderland, Durham, England, son of Leonard Hutchison Moore and Ann Waters. In 1891 Leonard was a butcher at 31 Thompson Street, Bishopwearmouth, Durham with wife Mary and 4 children. In 1901 he was a butcher as 29 Thompson Street with Mary and 5 children. In 1911 he was a master butcher and grocer at 61 St. Leonard Street, Sunderland with Mary and son John (joiner). + 83 i Leonard Doeg5 Moore, born 18 Mar 1877 in Sunderland, Durham, England. He married Elizabeth Ann McGovern. 84 ii William James Doeg5 Moore, born 1 Feb 1885 in Sunderland, Durham, England. 85 iii Martha Ann Doeg5 Moore, born 24 Jan 1888 in Sunderland, Durham, England. 86 iv John Doeg5 Moore, born 11 Jan 1890 in Sunderland, Durham, England. 87 v Mary Jane Doeg5 Moore, born Oct 1897/97 in Sunderland, Durham, England. 32. Hannah (Ann) Marie4 Doeg (James3, David2, James1), born 19 Sep 1858 in Sunderland, Durham, England; died Nov 1915 in Seaham Harbour, Durham, England; buried 20 Nov 1915 in Seaham Harbour, Durham, England. She married on 15 Apr 1876 in St. Mary'S,¿ Sunderland,¿ Durham,¿ England Matthew Miller, born 1848/49 in York, England; died 25 Feb 1896 in Seaham Harbour, Durham, England; buried 1 Mar 1896 in Princess Road Cemetery, Seaham Harbour, Durham, England, son of John Miller and Ellen Ditchburn. In 1876 Matthew was a van driver residing at Back Dundas Street, Monkwearmouth. After his marriage he moved to 21 Old Model Place, Darlington where he worked as a railway porter. In 1881 Matthew was an Agent residing at 13 Mordey Street, Bishopwearmouth, Durham (page 1) with his wife Ann M. and children John James and Mary Jane. In 1891 they lived at 11 Green Street, Newley Wiske, Yorkshire. At the time of his death in 1896 he was a general laborer at the Bottle Works and resided at 1 Ropery Walk, Seaham Harbour. According to Matthew's daughter Mary Jane, his stomach was donated to the University Teaching Hospital for early cancer research. 88 i John James5 Miller, born 1876/77 in Darlington, Durham, England. 89 ii Mary Jane5 Miller, born 8 May 1880 in Sunderland, Durham, England; died 10 Jun 1955 in Newcastle, NSW, Australia. She married (1) on 30 Jul 1899 in St. Mary Magdalene's R.C. Church, Seaham Harbour, Durham, England Francis Watson, born 1878/79 in Seaham Harbour, Durham, England; died 29 May 1917 in France, son of Thomas Watson and Elizabeth Buglass; (2) on 4 Aug 1919 in Seaham Harbour, Durham, England Richard LeRoy, born 19 Mar 1888 in Seaham Harbour, Durham, England; died 9 Oct 1958 in Wallsend, NSW, Australia, son of George LeRoy and Ellen Wheatman. 90 iii William D.5 Miller, born 1885/86 in Sunderland, Durham, England. 91 iv Bridget Eleanor5 Miller, born Jul 1888/88 in Berwick, Durham, England. 92 v Mary Sarah5 Miller, christened 19 Apr 1891 in St. Mary Magdalene's R.C. Church, Seaham Harbour, Durham, England. She married on 8 Oct 1911 in St. Mary Magdalene's R.C. Church, Seaham Harbour, Durham, England James Samuel Clark, born abt 1887 in England. 93 vi Elizabeth5 Miller, christened 24 Dec 1893 in St. Mary Magdalene's R.C. Church, Seaham Harbour, Durham, England. She married on 20 Sep 1912 in St. Mary Magdalene's R.C. Church, Seaham Harbour, Durham, England Edward Edwards, born abt 1889 in England. 36. Kate Aquila4 Randall (Sarah3 Doeg, David2, James1), born Apr 1862/62 in St. George Hanover Square, Middlesex, London, England. She married in Apr 1882/82 in St. Olave Southwark, London, England James A. Sampson, born 1855/56 in Chasewater, Cornwall, Wales. In 1901 James was a wharf foreman residing at 61 Grundley Road, Deptford, London with his wife Kate and 5 children. 94 i James Andrew A.5 Sampson, born Jan 1883/83 in Bermondsey (St. Olave), London, England. 95 ii Kate Randall5 Sampson, born Jul 1884/84 in Bermondsey (St. Olave), London, England. 96 iii Ethel M.5 Sampson, born 1889/90 in Bermondsey, London, England. 97 iv Annie M.5 Sampson, born 1891/92 in New Crors, London, England. 98 v Harold Willie5 Sampson, born Jan 1893/93 in Deptford (Greenwich), London, England. 40. Charles Gordon Grant4 Doeg (William Samuel3, William2, James1), born Oct 1848/48 in Exeter, Devon, England; died Oct 1895/95 in West Derby, Lancashire, England. He married Margaret Temple, born 1848/49 in Ireland; died Apr 1897/97 in West Derby, Lancashire, England. In 1891 Charles was a master compositor residing at 9 Cromwell Lane, South Everton, Lancashire with his wife Margaret and son Alfred. In 1901 Margaret was a bag sorter in a paper mill residing in Heywood, Lancashire. 99 i John Joseph5 Doeg, born 19 Dec 1872 in Dundalk, Louth, Ireland. + 100 ii Alfred James5 Doig, born 1875/76 in Dundalk, Louth, Ireland; died Jul 1910/10 in West Derby, Lancashire, England. He married Margaret McDonald. 41. Mary Catherine4 Venn (Ellen (Helen)3 Doeg, William2, James1), born Jul 1857/57 in Exeter, Devon, England. She married in Jan 1879/79 in Exeter, Devon, England Frederick (Fred) Folkard, born Apr 1856/56 in Wrentham (Blything), Suffolk, England. In 1881 Frederick was a butler residing on High Street, Wrentham, Suffolk with his wife Mary and sons William and Frederick. 101 i William5 Folkard, born 1879/80 in Benacre, Suffolk, England. 102 ii Frederick Millbourne5 Folkard, born Apr 1881/81 in Wrentham (Blything), Suffolk, England. 103 iii Florence5 Folkard, born Oct 1882/82 in Wrentham (Blything), Suffolk, England. 104 iv Alfred Percival5 Folkard, born Oct 1886/86 in Wrentham (Blything), Suffolk, England. 105 v George Augustus5 Folkard, born Jul 1889/89 in Wrentham (Blything), Suffolk, England. 106 vi Laura Matilda5 Folkard, born Jan 1891/91 in Wrentham (Blything), Suffolk, England. 43. James Doeg4 Venn (Ellen (Helen)3 Doeg, William2, James1), born Apr 1861/61 in Exeter, Devon, England; died 19 Dec 1948 in Exeter, Devon, England. He married in Oct 1885/85 in Exeter, Devon, England Annie Lewis, born 1860/61 in Exeter, Devon, England; died Jan 1942/42 in Exeter, Devon, England. In 1891 James was an accountant residing at 32 Oxford Terrace, St. Sidwell, Devon with his wife Annie, children Edith and James, and a servant. In 1901 he worked in the Town Clerks Office and lived at 40 Oxford Road, Exeder, Devon. In 1911 he was the Chief Clerk for the City Council at the same address. In 1914 and 1923 he still lived at 40 Oxford Road. Probate: Venn, James Doeg of 3 Thurlow-road, Mount Pleasant, Exeter died 9 December 1948 at 95 Exeter-road, Exmouth, Devonshire. Probate Exeter 29 December to James Spencer Lewis Venn, insurance official, and Edith Penwarden (wife of George Montague). Effects L843 13s. 10d. 107 i Edith5 Venn, born Jul 1886/86 in Exeter, Devon, England; died Apr 1974/74 in Exeter, Devon, England. She married in Jul 1921/21 in Exeter, Devon, England George Montague Penwarden, born 1881/82; died Jul 1958/58 in Devon Central, Devon, England. + 108 ii James Spencer Lewis5 Venn, born Apr 1890/90 in Exeter, Devon, England; died 10 Jul 1960 in Exeter, Devon, England. He married Amy Collacott. 44. Amy Margaret4 Venn (Ellen (Helen)3 Doeg, William2, James1), born Oct 1866/66 in Exeter, Devon, England. She married in Oct 1887/87 in Exeter, Devon, England William Henry Parker, born Oct 1850/50 in Ipplepen (Newton Abbot), Devon, England, son of Henry George Parker and Jane (---). In 1891 William was a general laborer at Lanesdone Road, Ipplepen, Devon with wife Amy and sons William and Lionel; they lived with his parents. In1901 and 1911 he was a weighbridge clerk at a pottery at 11 Pottery Cottages, Kingsteignton, Devon with Amy and children. 109 i William Percival5 Parker, born Apr 1888/88 in Exeter, Devon, England. 110 ii Lionel5 Parker, born Jan 1890/90 in Heavitree (St. Thomas), Devon, England. 111 iii Holly5 Parker, born Jan 1894/94 in Ipplepen (Newton Abbot), Devon, England. 112 iv Beatrice5 Parker, born Jan 1896/96 in Ipplepen (Newton Abbot), Devon, England. 113 v Vincent5 Parker, born Jul 1898/98 in Ipplepen (Newton Abbot), Devon, England. 114 vi Frederick John5 Parker, born Jul 1901/01 in Kingsteignton (Newton Abbot), Devon, England. 115 vii Irene Catheine5 Parker, born Jan 1905/05 in Kingsteignton (Newton Abbot), Devon, England. 116 viii George5 Parker, born Apr 1909/09 in Kingsteignton (Newton Abbot), Devon, England. 71. David John5 Doeg (David John4, James3, David2, James1), born 19 Apr 1883 in Sunderland, Durham, England; died Jan 1953/53 in Sunderland, Durham, England. He married in Jul 1903/03 in Sunderland, Durham, England Mary Ann Miller, born 1884/85 in Harwell, Durham, England; died 15 Jan 1944 in Sunderland, Durham, England. ROBBERY WITH VIOLENCE AT SUNDERLAND. George Barber (21), labourer, David John Doeg (19), labourer, and John Hayes were jointlycharged with robbery with violence from Jane Graham, at Sunderland, on October 13th. Mr Gawnn Taylor prosecuted. He said that the prosecutrix, Mrs Graham, lived in Newcastle and on October the 13lh last visited her sister, who lived in Spring Garden Lane, Sunderland. She left the house, and, as she stepped into Spring Garden Lane, Barber rushed at her and struck her on the temple. She then ran up the street towards Coronation Street, when she heard Doeg and Hayes following her, and the former struck her on the breast. She felt the youths pulling at her pocket, and when she put her hand round to protect her pocket she got her finger cut. The defence was that the story told for the prosecution was untrue, and that Mrs Graham was going about the lane during the afternoon in a drunken condition, that the police had to be brought, and that she was thrown out of her sister's house. During the hearing of the case Doeg protested against. Detective Marshall talking to Mr Taylor an objection which caused some amusement. In laying the case before the jury, Justice Channell said that if the prosecution was properly conducted, and he had no doubt it was, if these allegations of the police having to be called in had been made at the court, and the story they had heard to-day been told before the magistrates, the policemen who had been called would have been there, it must, be remembered that prosecutions were not conducted in this country with the object of obtaining a conviction when people were not guilty; thus reliable evidence would have been forthcoming from the police. The jury found the prisoners all guilty. Detective Marshall said they had had a good deal of trouble with Barber, but not the other two Justice Charincll said they must repress those concerted robberies. Barber would be sentenced 18 months, and Hayes und Doeg to nine months' imprisonment each. In 1911 D. J. Doeg lived in Sunderland with wife M. A. and children Isabella, D. J. Jun., Beatrice, and William James. In WWI David served as a Private in the Machine Gun Corps and was awarded the British War Medal and Victory Medal. Probate: Mary Ann Doeg of 39 Nile Street Sunderland (wife of David John Doeg) died 15 January 1944 at Municipal Hospital Sunderland. Administration Durham 28 August to said David John Doeg shipyard helper. Effects £201 17s 6d. 117 i Isabella6 Doeg, born 28 Aug 1904 in Sunderland, Durham, England. She married in Jul 1921/21 in Sunderland, Durham, England John Eliot, born abt 1903 in England. 118 ii David John6 Doeg Jr., born 11 Feb 1906 in Sunderland, Durham, England; died 22 Dec 1972 in Sunderland, Durham, England. Notes: Probate: David John Doeg of 44 Corfu Road Hylton Castle Estate Sunderland died 22 December 1972. Probate Newcastle on Tyne February £458. + 119 iii Beatrice Elizabeth6 Doeg, born 7 Aug 1908 in Sunderland, Durham, England; died Jan 1968/68 in Sunderland, Durham, England. She married John Softley Stubbs. + 120 iv William James6 Doeg, born 5 Dec 1909 in Sunderland, Durham, England; died 17 Oct 1984 in Sunderland, Durham, England; buried 22 Oct 1984 in Sunderland Crematorium, Sunderland, Durham, England. He married Elizabeth J. (Liz) Young. 121 v Elizabeth Jane6 Doeg, born 31 Jan 1913 in Sunderland, Durham, England. She married in Oct 1932/32 in Sunderland, Durham, England Peter Smith, born abt 1912 in England. 122 vi Albert Edward6 Doeg, born 29 Apr 1915 in Sunderland, Durham, England; died Dec 1988 in Sunderland, Durham, England. Notes: Edward was knocked over by a horse and cart at the age of 2 and suffered brain damage. He spent most of his life in Cherry Knowle Assylum in Sunderland. 72. Thomas Coulthard5 Doeg (David John4, James3, David2, James1), born 14 Jan 1886 in Sunderland, Durham, England; died 16 May 1936 in Sunderland, Durham, England; buried 21 May 1936 in Bishopwearmouth. He married in Oct 1920/20 in Sunderland, Durham, England Edith Mary (Maria) Anna Grummett, born 1884/85 in England; died 15 Jan 1944 in Sunderland, Durham, England; buried 20 Jan 1944 in Sunderland, Durham, England. + 123 i David John6 Doeg, born 17 Jun 1921 in Sunderland, Durham, England; died 7 Dec 1996 in Sunderland, Durham, England. He married (1) Isabella Pocklington or Davison; (2) Edith Ann Bryan. 124 ii William Grummitt6 Doeg, born 7 May 1923 in Sunderland, Durham, England; died Dec 1991 in Sunderland, Durham, England. + 125 iii Thomas Coulthard6 Doeg, born 22 May 1925 in Sunderland, Durham, England; died Dec 1991 in Sunderland, Durham, England. He married Mary Isabella Close. + 126 iv Edith6 Doeg, born Apr 1927/27 in Sunderland, Durham, England. She married Edward Rutter. + 127 v Veronica6 Doeg, born 1 Feb 1929 in Sunderland, Durham, England; died Aug 1992 in Sunderland, Durham, England. She married Robert Turner. 128 vi Joseph6 Doeg, born 12 Oct 1930 in Sunderland, Durham, England; died Feb 2007 in Sunderland, Durham, England. 129 vii James6 Doeg, born 23 Jul 1933 in Sunderland, Durham, England; died Feb 2003 in Doffoten, Nordland Co., Norway. 130 viii Robert (Bob)6 Doeg, born 23 Jul 1933 in Sunderland, Durham, England; died Aug 2003 in Sunderland, Durham, England. He married in Apr 1958/58 in Sunderland, Durham, England Thomasina (Ena) Wilson, born 1925/26 Of Sunderland, Durham, England; died 22 Feb 2011 in Sunderland, Durham, England. 74. Margaret5 Doeg (David John4, James3, David2, James1), born 20 Apr 1892 in Sunderland, Durham, England. She married in Apr 1912/12 in Sunderland, Durham, England Ferguson Gowland Tinmouth, born Apr 1888/88 in Sunderland, Durham, England, son of James Robert Tinmouth and Alice (---). 131 i Margaret6 Tinmouth, born Jul 1913/13 in Sunderland, Durham, England. 132 ii Mary J.6 Tinmouth, born Jul 1915/15 in Sunderland, Durham, England. 133 iii Alice G.6 Tinmouth, born Jul 1917/17 in Sunderland, Durham, England. 134 iv Ferguson G.6 Tinmouth, born Jan 1921/21 in Sunderland, Durham, England; died Oct 1930/30 in Sunderland, Durham, England. 135 v James R.6 Tinmouth, born Apr 1926/26 in Sunderland, Durham, England. 83. Leonard Doeg5 Moore (Mary Jane4 Doeg, James3, David2, James1), born 18 Mar 1877 in Sunderland, Durham, England. He married in Apr 1902/02 in Sunderland, Durham, England Elizabeth Ann McGovern. 136 i Leonard Golden6 Moore, born 6 Feb 1903 in Sunderland, Durham, England; died Mar 1979 in Sunderland, Durham, England. 137 ii Elizabeth6 Moore, born abt 1906 in Sunderland, Durham, England. 138 iii Mary6 Moore, born abt 1909 in Sunderland, Durham, England. 100. Alfred James5 Doig (Charles Gordon Grant4, William Samuel3, William2, James1), born 1875/76 in Dundalk, Louth, Ireland; died Jul 1910/10 in West Derby, Lancashire, England. He married in Jul 1900/00 in West Derby, Lancashire, England Margaret McDonald, born Jan 1879/79 in Liverpool, Lancashire, England; died Jan 1957/57 in Liverpool North, Lancashire, England, daughter of Archibald McDonald and Elizabeth Ryan. In 1901 Alfred was a dock laborer in Everton, Lancashire, England with his wife Margaret. Note: Children listed are uncertain and based on age and location. In 1911 Margaret Doig was a charwoman at 65 Hugh Street, Liverpool, Lancashire with children Margaret, Archibald, Amy, and Alfred Charles. 139 i Margaret6 Doig, born Jul 1901/01 in West Derby, Lancashire, England. 140 ii Archibald6 Doig, born 10 Oct 1903 in West Derby, Lancashire, England; died Jul 1986 in Liverpool, Lancashire, England. Notes: He may be the Archibald E. Doig who married Alice Rhodes in July/Sept 1927 in Barton upon Irwell, Lancashire. 141 iii Elizabeth6 Doig, born Jan 1906/06 in Liverpool, Lancashire, England; died Jul 1908/08 in Liverpool, Lancashire, England. + 142 iv Amy6 Doig, born Apr 1908/08 in Liverpool, Lancashire, England. She married Archibald Victor Wilson. + 143 v Alfred Charles (Scotty)6 Doig, born 29 Sep 1910 in Liverpool, Lancashire, England; died 11 Nov 1992 in Peterborough, Ontario, Canada. He married Hazel (Fern) Esson. 108. James Spencer Lewis5 Venn (James Doeg4, Ellen (Helen)3 Doeg, William2, James1), born Apr 1890/90 in Exeter, Devon, England; died 10 Jul 1960 in Exeter, Devon, England. He married on 25 Jun 1921 in St. Thomas, Devon, England Amy Collacott, born Oct 1894/94 in Ebford, Woodbury, Devon, England; died Jan 1989/89 in Ebford, Woodbury, Devon, England, daughter of Joseph Collacott and Clara (---). James was an insurance official. James served in the Devonshire Regiment during WWI. Probate: Venn, James Spencer Lewis of 3 Thurlow Road, Exeter died 10 July 1960. Probate Exeter, 15 August, to Amy Venn, widow. Effects L.2365 15s. 1d. There was pretty wedding at St. George's Church, Clyst St. George, on Saturday last,when the marriage was solemnised MSpencer Lewis Venn, only son of Mr. and Mrs. J. D. Venn, Oxford-road, Exeter, and Miss Amy Collacott, second daughter of Mr. and Mrs.J. Collacott. of Rose Cottage, Ebford, Topshani. The officiating clergyman was the Rector, Rev. E. V. B. Weber. The bride, who was given away by her father, was attired in a navy blue crepe de chine dress with hat to match. She carried a bouquet of yellow roses and was attended by her sister. Miss Betty Collacott. Mr. Gowyn Venman, an old friend and colleague of the bridegroom, acted as best man. The bridegroom's gift to the bride was a gold wristlet watch, and the bride's gift a gold signet ring. The happy couple were the recipients of a large number of handsome and useful presents, amongst which was a clock in oak case presented to the bridegroom the staff of the Commercial Union Assurance Co., Exeter. A reception was held at the home the bride, after which the happy couple left for Ilfracombe, where the honeymoon is being spent. 144 i Michael J. C.6 Venn, born Apr 1923/23 in Exeter, Devon, England. 145 ii Christopher J. L.6 Venn, born Jan 1929/29 in Exeter, Devon, England. 119. Beatrice Elizabeth6 Doeg (David John5, David John4, James3, David2, James1), born 7 Aug 1908 in Sunderland, Durham, England; died Jan 1968/68 in Sunderland, Durham, England. She married in Apr 1928/28 in Sunderland, Durham, England John Softley Stubbs, born 1899 in Sutherland, Durham, England, son of Michael Softley Stubbs and Margaret Ann Wilson. 146 i Mary P. Softley7 Stubbs, born Oct 1928/28 in Sunderland, Durham, England; died Jul 1929/29 in Sunderland, Durham, England. 147 ii John Softley7 Stubbs, born Jan 1930/30 in Sunderland, Durham, England. 148 iii Mary A. Softley7 Stubbs, born Oct 1931/31 in Sunderland, Durham, England. 149 iv David Softley7 Stubbs, born Jan 1933/33 in Sunderland, Durham, England. 150 v Brian Softley7 Stubbs, born Oct 1934/34 in Sunderland, Durham, England. 151 vi Margaret Softley7 Stubbs, born Jan 1937/37 in Sunderland, Durham, England. 152 vii Beatrice E.7 Stubbs, born Jan 1939/39 in Sunderland, Durham, England. 153 viii Vera7 Stubbs, born Jan 1941/41 in Sunderland, Durham, England. + 154 ix Ralph Softley7 Stubbs, born 10 Jan 1943 in Sunderland, Durham, England; died Mar 2007 in Sunderland, Durham, England. He married Mary Forester. 120. William James6 Doeg (David John5, David John4, James3, David2, James1), born 5 Dec 1909 in Sunderland, Durham, England; died 17 Oct 1984 in Sunderland, Durham, England; buried 22 Oct 1984 in Sunderland Crematorium, Sunderland, Durham, England. He married in Jul 1929/29 in Sunderland, Durham, England Elizabeth J. (Liz) Young, born 1909/10 Of Sunderland, Durham, England; died 22 Jan 2010 in Sunderland, Durham, England. DOEG Highcliffe Care Centre Formerly of Trinity Square East End Peacefully, surrounded by her devoted family, on January 22, aged 100 years, Liz (nee Young), beloved mam of Irene, Betty, Sheila and the late Ann, dearest mother-in-law of Ronnie, Alf and the late Tommy and Mark, a much loved nana, great-nana, great-great-nana, dear sister of Fred and Doris also a very dear aunt. Cortege leaving Irene's residence at 2.15pm on Monday, February 1, for service in Sunderland Minster, High Street West, at 2.45pm, followed by cremation in Sunderland Crematorium at 3.30pm. Resting at TP Bradbury's Private Chapel of Rest, 227 Hylton Road, Millfield. At rest. 155 i Mary A. Y.7 Doeg, born Jul 1929/29 in Sunderland, Durham, England. 156 ii Irene7 Doeg, born Apr 1931/31 in Sunderland, Durham, England. 157 iii Elizabeth J.7 Doeg, born Jul 1933/33 in Sunderland, Durham, England. 158 iv Shiela7 Doeg, born Jul 1938/38 in Sunderland, Durham, England. 159 v Mary A. M.7 Doeg, born Jul 1944/44 in Sunderland, Durham, England. 123. David John6 Doeg (Thomas Coulthard5, David John4, James3, David2, James1), born 17 Jun 1921 in Sunderland, Durham, England; died 7 Dec 1996 in Sunderland, Durham, England. He married (1) in Apr 1943/43 in Sunderland, Durham, England Isabella Pocklington or Davison; (2) in Oct 1946/46 in Sunderland, Durham, England Edith Ann Bryan, born 22 Nov 1927 in Sunderland, Durham, England; died 29 Mar 1993 in Sunderland, Durham, England, daughter of Alexander Bryan and Catherine Waterson. 160 i Edith A.7 Doeg, born Jan 1948/48 in Sunderland, Durham, England. 161 ii Elizabeth7 Doeg, born Jan 1950/50 in Sunderland, Durham, England. 162 iii Brenda7 Doeg, born Jul 1955/55 in Sunderland, Durham, England. 163 iv David J.7 Doeg, born Oct 1958/58 in Sunderland, Durham, England. 125. Thomas Coulthard6 Doeg (Thomas Coulthard5, David John4, James3, David2, James1), born 22 May 1925 in Sunderland, Durham, England; died Dec 1991 in Sunderland, Durham, England. He married in Oct 1946/46 in Sunderland, Durham, England Mary Isabella Close, born 1921/22 Of Sunderland, Durham, England; died Dec 1999 in Sunderland, Durham, England. + 164 i Thomas Coulthard7 Doeg, born Jan 1951/51 in Sunderland, Durham, England; died 15 Apr 2009 in Sunderland, Durham, England. He married Margaret Parkin. 165 ii William (Billy)7 Doeg, born Apr 1953/53 in Sunderland, Durham, England. 166 iii Keith7 Doeg, born Oct 1955/55 in Sunderland, Durham, England. He married in Oct 1977/77 in Sunderland, Durham, England Sylvia McNaught. 126. Edith6 Doeg (Thomas Coulthard5, David John4, James3, David2, James1), born Apr 1927/27 in Sunderland, Durham, England. She married in Jan 1948/48 in Sunderland, Durham, England Edward Rutter, born abt 1923 Of England. 167 i Eric7 Rutter, born Apr 1949/49 in Sunderland, Durham, England. 168 ii Shirley7 Rutter, born Jan 1951/51 in Sunderland, Durham, England. 169 iii Shiela7 Rutter, born Apr 1954/54 in Sunderland, Durham, England. 127. Veronica6 Doeg (Thomas Coulthard5, David John4, James3, David2, James1), born 1 Feb 1929 in Sunderland, Durham, England; died Aug 1992 in Sunderland, Durham, England. She married in Jan 1950/50 in Sunderland, Durham, England Robert Turner, born abt 1925 Of Sunderland, Durham, England. 170 i Jean7 Turner, born Jan 1951/51 in Sunderland, Durham, England. 171 ii Linda7 Turner, born Jan 1952/52 in Sunderland, Durham, England. 172 iii Julie A.7 Turner, born Oct 1954/54 in Sunderland, Durham, England. 173 iv Robert I.7 Turner, born Apr 1958/58 in Sunderland, Durham, England. 174 v Thomas E.7 Turner, born Oct 1961/61 in Sunderland, Durham, England. 142. Amy6 Doig (Alfred James5, Charles Gordon Grant4, William Samuel3, William2, James1), born Apr 1908/08 in Liverpool, Lancashire, England. She married in Jan 1930/30 in West Derby, Lancashire, England Archibald Victor Wilson, born Jan 1908/08 in Liverpool, Lancashire, England. 175 i Victor7 Wilson, born Jul 1930/30 in West Derby, Lancashire, England. 143. Alfred Charles (Scotty)6 Doig (Alfred James5, Charles Gordon Grant4, William Samuel3, William2, James1), born 29 Sep 1910 in Liverpool, Lancashire, England; died 11 Nov 1992 in Peterborough, Ontario, Canada. 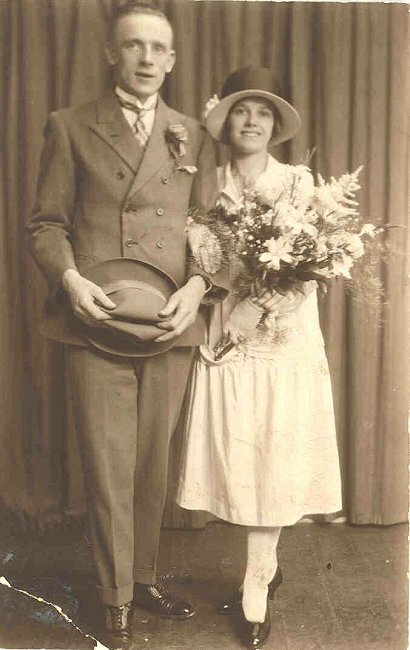 He married on 10 Jun 1950 in Knox United Church, Peterborough, Ontario, Canada Hazel (Fern) Esson, born 20 Aug 1919 in Otonabee Township, Peterborough, Ontario, Canada; died in Peterborough, Ontario, Canada, daughter of Kenneth Wesley Esson and Flora Morrison. I Spoke with Alfred in telephone conversation 19 Feb 1992 (KD). His nickname was "Scotty." Hazel is still alive in 2008. + 176 i Lorraine Fern7 Doig, born 18 Jul 1957 in Peterborough, Ontario, Canada. She married James Hayes. + 177 ii Alan Edward7 Doig, born 25 Sep 1960 in Peterborough, Ontario, Canada. He married Cindy Delle Monache. 154. Softley7 Stubbs (Beatrice Elizabeth6 Doeg, David John5, David John4, James3, David2, James1), born 10 Jan 1943 in Sunderland, Durham, England; died Mar 2007 in Sunderland, Durham, England. He married Mary Forester, born abt 1947 in England. + 178 i Deborah8 Stubbs. She married Kevin B. Gilbert. 179 ii Paul Steven8 Stubbs. + 180 iii Ralph Patrick8 Stubbs. He married Louise Brown. 164. Thomas Coulthard7 Doeg (Thomas Coulthard6, Thomas Coulthard5, David John4, James3, David2, James1), born Jan 1951/51 in Sunderland, Durham, England; died 15 Apr 2009 in Sunderland, Durham, England. He married in Jul 1973/73 in Sunderland, Durham, England Margaret Parkin. DOEG South Hylton Peacefully, in hospital, after a short illness, on April 15, aged 58 years, Tommy, a much loved soulmate of Susan (Silk), a dear dad, step-dad and grandad, also a dearest brother, brother-in-law and uncle. Friends please meet for service and cremation at Sunderland Crematorium, on Wednesday, April 22, at 10.30am. All welcome afterwards to The Grindon Mill for refreshments. All enquiries to John Hogg Family Funeral Directors, St Lukes Terrace, Pallion. Tel. 5142744. Loved and remembered always. 181 i Steven8 Doeg, born Jan 1974/74 in Sunderland, Durham, England. 182 ii Thomas8 Doeg, born Jan 1974/74 in Sunderland, Durham, England. 183 iii Margaret8 Doeg, born Jul 1977/77 in Sunderland, Durham, England. 184 iv Lynsey Jane8 Doeg, born Apr 1983/83 in Sunderland, Durham, England. 176. Lorraine Fern7 Doig (Alfred Charles (Scotty)6, Alfred James5, Charles Gordon Grant4, William Samuel3, William2, James1), born 18 Jul 1957 in Peterborough, Ontario, Canada. She married James Hayes, born abt 1953 Of Canada. Lorraine is a purchasing manager. 185 i John Allan8 Hayes, born 28 May 1990 in Peterborough, Ontario, Canada. 186 ii Kelsey8 Hayes, born 23 Mar 1994 in Peterborough, Ontario, Canada. 177. Alan Edward7 Doig (Alfred Charles (Scotty)6, Alfred James5, Charles Gordon Grant4, William Samuel3, William2, James1), born 25 Sep 1960 in Peterborough, Ontario, Canada. He married on 27 Jun 1992 in Welland, Ontario, Canada Cindy Delle Monache, born abt 1964 Of Canada. Alan is a sales manager. Cindy is a pharmacy consultant. 187 i Adam8 Doig, born 1994 in Calgary, Alberta, Canada. 188 ii Nathan8 Doig, born 1997 in Canada. 178. Deborah8 Stubbs (Ralph Softley7, Beatrice Elizabeth6 Doeg, David John5, David John4, James3, David2, James1). She married in May 1992 in Sunderland, Durham, England, divorced Kevin B. Gilbert. 180. Ralph Patrick8 Stubbs (Ralph Softley7, Beatrice Elizabeth6 Doeg, David John5, David John4, James3, David2, James1). He married Louise Brown.